Probably the most notable structure on the Heiligenberg is the Thingstätte. 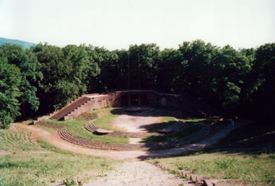 This open-air amphitheatre was built in 1935 by the Nazi party and was designed by Heidelberg native Albert Speer. It was used by the Nazi party during WWII for rallies and solstice festivals. It is now preserved as a monument, but it is still used for many festivals and cultural events throughout the year. The acoustics in the amphitheatre are exceptional – you can hear people speaking in their normal voices from the stage even when standing nearly 200 meters away at the back of the theatre.